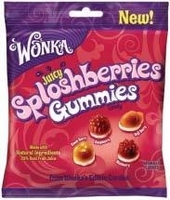 Wonka Splosberries gummy candy is the newest of the gummies from Wonka's editable garden. Soft and chewy gummy candy in the shape of berries. You get a berry shaped gummy with a jelly fruit filling and a somewhat marshmallow bottom all in one fun candy. Each bag of Squishy splosberries comes in 4 berry flavors. You get Blueberry, Raspberry, Cloud Berry and Goji Berry. And yes cloud berries and goji berries are reall berries and have a good fruity taste. Willy Wonka has come up with some really different candies through out the years and this one is right on top of the list. Although they sound quite different they are actually a very good gummy treat. Each bag is 6.5 oz. of berry fruity fun.